Al Co held off the challenge of last year's winner Godsmejudge to win the Scottish National at odds of 40-1. Jockey Jamie Moore was almost thrown from the horse yards from the finish, but hung on to beat Godsmejudge (16-1) into second by a length and a half. "Al Co and Jamie Moore had to survive a late and potentially catastrophic scare when the horse was twice distracted in the very closing stages, jinking as a result; a lesser horseman might well have been dislodged. "But Moore kept the partnership together magnificently to continue a popular run of big-race success after his exploits with Sire De Grugy, the Cheltenham Festival's new Queen Mother Champion Chaser. "Meanwhile, like Aintree, the Grand National was delayed by a false start with Battle Group again in the thick of the problem. 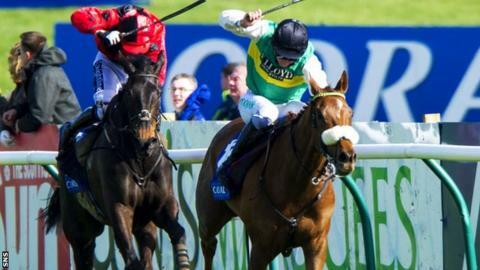 "The horse's non-participation at Ayr was the third time he'd messed things up in four races, and trainer Johnny Farrelly later tweeted he had been retired." Second favourite Trustan Times (10-1) was third, ahead of Merry King (16-1). Scottish-trained Green Flag battled gamely before tiring after the last, while veteran steeplechaser Tidal Bay was among the leaders before fading. Winning trainer Peter Bowen, who is based in Pembrokeshire, said Al Co was "in the best form we've ever had him" and added he will be aimed at next year's Crabbie's Grand National. He said: "He got to the front too soon, but there was nothing he could do about it and I have a lot of faith in Jamie." Moore said: "I won the Scottish Champion Hurdle in 2004 [on Copeland], so it's been a while since I had another winner here. "Peter told me he had him spot on, but twice up the run-in he spooked at boards or something. I honestly nearly fell off twice, and thank God I didn't. "Peter puts me up a lot and it's nice to do it for people you ride for." The race was delayed by a false start, just as last week's Aintree showpiece had been, with Battle Group again involved. It was the third time in four races the nine-year-old had refused to race, and trainer Johnny Farrelly later tweeted his charge had been retired.